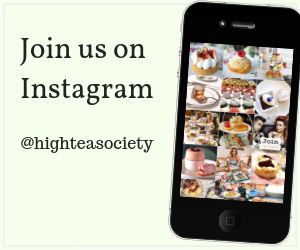 High Tea Society was lucky enough to be invited to the launch of The Halkin’s afternoon tea, newly partnered with the beautiful Jing Tea. Set in the heart of Belgravia, around the corner from Buckingham Palace, Piccadilly and Hyde Park, the chefs at the five-starred Halkin have carefully thought through their new offering which includes a good selection of sandwiches, light and petite scones along with a gorgeous selection of pastries. The afternoon tea began with a glass of Louis Roederer Brut Premier Champagne which led onto us being served a selection of Jing’s teas which included white peony, oolong, jasmine pearls and Assam. We were then offered a selection of fresh sandwiches with delicious fillings that included Scottish smoked salmon, cucumber, prawn and chicken. Dainty and buttery scones were served fresh from the oven and were a good interlude between the sandwiches and what we had really come for – the very well presented selection of pastries. Highlights for us were the raspberry and passionfruit macaroons which were surprisingly light along with the decadent Opera, an almond and cocoa sponge cake soaked in coffee and chocolate mousse. All in all, the quality of the food was good, the service friendly and welcoming and the furniture comfortable – the type of sofas that you just want to sink into and make yourself at home for an afternoon. 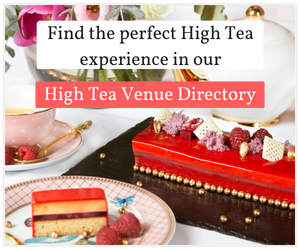 We would suggest having afternoon tea at The Halkin as a friendly place to drop in while on a walk through Belgravia or a nice quiet spot to enjoy a good long gossip with friends after visiting some of the local sites, of which there are many. The food was good quality with well-filled sandwiches and plenty of dainty scones and cakes. The highlight for us was the raspberry and passionfruit macaron. 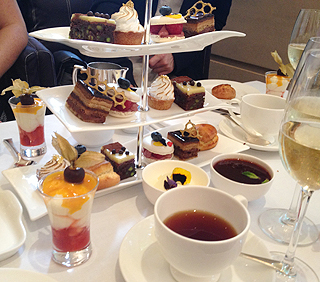 The tea was light and delicate and matched the food perfectly. Jing Tea was served and we tried white peony, high mountain oolong, jasmine pearls and Assam. All served with freshly made scones with clotted cream and strawberry jam. 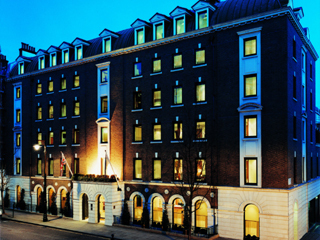 Comfortable with Italianesque design, The Halkin is one of Belgravia’s more modern venues and has a calm yet friendly atmosphere. 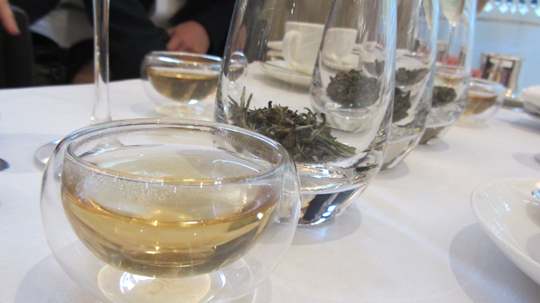 The tea was served in the Halkin’s own bone China, however, we sampled several of the teas in Jing Tea’s own glassware. From cocktail parties to private dining, press days to wedding celebrations, special events at The Halkin always combine award-winning cuisine with acclaimed design and seamless service. A more intimate and residential look is possible with The Halkin’s comfortable, light-filled COMO Suites. 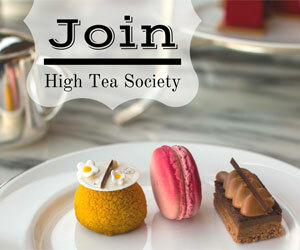 At £28 per person it is on par with London’s more established tea venues. The food was good quality and the service was excellent. As a bonus we were also treated to a reading by Britain’s Tea Poet, Elizabeth Darcy Jones – her book is delightful and a must for tea lovers of all shapes and sizes – if you’d like to know more see www.teapoet.com. 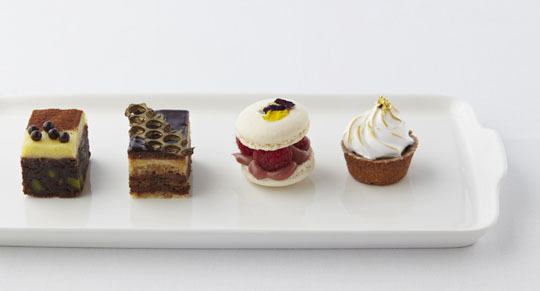 The Halkin Afternoon Tea is priced at £28 per person. 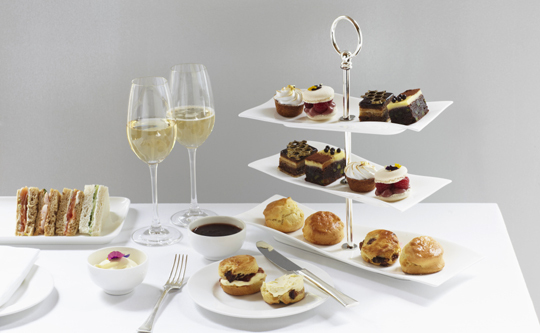 With a glass of Champagne (Louis Roederer Brut Premier) £38 per person.